Can I tell you that my pressure cooker is one of the best gifts I’ve ever gotten? My mom gave it to me last Christmas when she saw me coveting hers and the speediness in which she could make a stew or a pot of beans. I’ve been happily saving time ever since. I grew up with the sound of a pressure cooker chug-chug-chugging away like a steam engine on my grandmothers’ stoves, discount so I never thought to be afraid of them. Recently, someone posted about their Pressure Cooker Phobia on the Serious Eats message boards. I quickly chimed in with reassurance and recipes, but it got me thinking that some people don’t quite “get” why a pressure cooker is any better than a pot. Sure, you can cook your food in record time, but I think there’s more to it than that. A pressure cooker traps heat and steam, regulated by a small valve so that it won’t explode. Because the steam recirculates, the liquid and everything inside reaches much higher temperatures than it would in a regular pot. Not only does this cook your food faster, but it also allows the flavors to meld and intensify without drying out. So, even though it’s still hot down in my part of the country, I’ve been craving a thick, hearty ragu and decided to give it a go in the pressure cooker. Normally, my ragu takes at least 3 hours on low heat until the meat is tender and falling apart enough for me claim success. 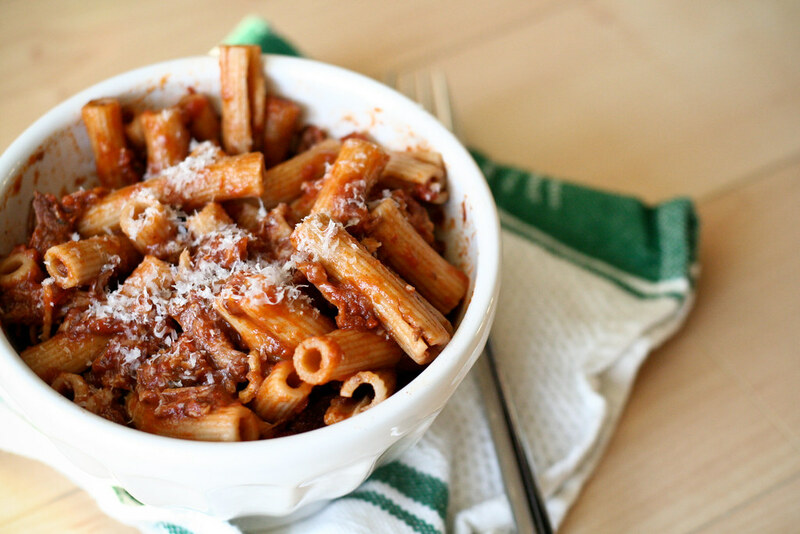 This ragu took 30 minutes, start to finish. I kid you not. Thirty minutes. And boy was it good! Instead of the usual lamb, I used pork center loin because it’s what I had. A quick sear, then add the rest of the ingredients, seal the pot and 25 minutes later, a deliciously rich and intense ragu for my rigatoni. I may never make ragu the slow way again. Set your pressure cooker over medium-high heat. Once it’s hot, heat the olive oil, then sear the meat until browned on most sides, about 5 minutes. Add the remaining ingredients and affix the pressure cooker lid. Once the steam valve locks, cook for about 20 minutes. Remove from heat and let the steam valve come down, then release the pressure. Carefully open the lid, pulling it towards you so that the steam escapes away from your face. Use a 2 forks or a potato masher to break apart the meat. It should very, very tender and break apart on its own. Taste and add salt if needed. Serve over pasta or polenta. I love this recipe. I do something similar. But I’m a bigger fan of the higher connective tissue like shoulder over the loin. I feel like its too lean and doesn’t give that beautiful smooth mouth feel, nearly unctuous, quality of that broken down shoulder. I love my pressure cooker too. A useful tool in a pinch. Great photos. This looks amazing! Isn’t the pressure cooker just a wonder to behold? I had a ton of tomatoes this year and cooked a lot of them down into sauce in mine. Love it. What size pressure cooker would you recommend if I were to only buy 1? What will give me the most flexibility? Thanks for any advice for a soon to be first time pressure cooker owner. I have a new pressure cooker still in it’s box. I’m going to have to break it out for this recipe. The ingredients alone make me say, “mmmmm”. Thanks! That’s correct Meli!. The pressure cooker is regulated by a small valve so that it won’t explode. What that valve is preventing is a B-L-E-V-E. Pronounced (blevee). Boiling Liquid Expanding Vapor Explosion. So people, let go of your fears and welcome the chug-chug-chugging away of the flavor train! Yes indeed, Melissa…..you got my attention with this photo and the words PRESSURE COOKER…….I really should use mine more often….this recipe of yours may just make me dust it off. Over pasta would be wonderful….bit over polenta? Ohhhhhhhhh……….what a COMBO!!! I love praise for pressure cookers! I love mine, but I always get quizzical looks when I’m talking about it. This recipe looks fabulous, and I’ll try it soon. I cannot tell you how much I want a pressure cooker! Even though they do slightly scare me…I reckon curries would be amazing in there too. Bill – I have this 8-quart Presto Professional, which I think is the perfect size for large cuts of meat, big pots of beans and grains! Looks delicious; people who’ve never used a pressure cooker don’t know what they’re missing, especially with ragu I find. And it basically forces them to use ground meat instead of the great texture you get from this method. I posted my recipe for it with lamb, which I submit is more flavourful than with beef, but that’s a personal preference. That photo is making me hungry. Have just purchased a Fagor pressure cooker. Your recipe looks great. I cook a mean Italian ragu myself using beef from the shoulder. One question I have is after the meat is seared in the oil do you “mix” the other ingredients through? You do not specify this, as you just say “add” the other ingredients. The reason I ask this is that I’ve been reading a book by an Australian author, Juanita Phillips “My pressure cooker saved my life”. Juanita says that recipes containing tomatoes such as with ragu will often scorch or burn due to their sugar content. For this reason she recommends just placing the tomatoes, tomato paste, etc on top of the other ingredients. I would really appreciate comments on this aspect, i.e. whether to mix ingredients together as one normally would when cooking a ragu, or whether to just add the tomatoes and paste after the meat has been seared and not “mix” them together. Thanks so much for any advice on this. Don’t want to spoil my first attempt at cooking ragu the “fast and easy way” with a pressure cooker. I really meant to just add them to the top. I don’t mix them prior to affixing the lid. I’ve never had a problem with tomato-based recipes scorching, but that might be because I never mix ingredients when I’m using my pressure cooker (there’s just no need as they end up mixing themselves). Thanks so much for your reply. The idea of not mixing the ingredients is very new to me. I am definitely at the mercy of the experts though! The pressure cooker purchase is one of necessity. Trying to run a business and the other domestic side of life has become unbelievably difficult. Maybe I’m just getting slow in my old age! Thanks again for your speedy and helpful reply. Bit of a bummer! First meal made in my Fagor pressure cooker was osso bucco. Big thumbs down from the family. Spent quite a lot on the ingredients as I purchased meat (veal on the bone) from upmarket butcher. My guys (24, 27) thought it tasted “strange” and the texutre of the meat was too soft and like “gloop”. I thought it was okay myself but admit I did not like having to pick the meat off the bones. Think we prefer beef to veal and prefer large chunks of meat rather than a meal containing meat and bone. I did dust the meat with seasoned flour and pan fried prior to pressure cooking and browned it really well. Maybe we just don’t like osso bucco! Oh, well, you win some, you lose some, I suppose. That’s thought-provoking point of view. I wanr to return to your blog 1-2 days later.